This bracelet is the “original” Military Paracord bracelet that started the survival bracelet craze. Soldiers knotted up these bracelets while in theater as a way of carrying around versatile parachute cord around with them at all times. If you prefer you can order in two colors too! NOT bracelet size! Use our instructions here. 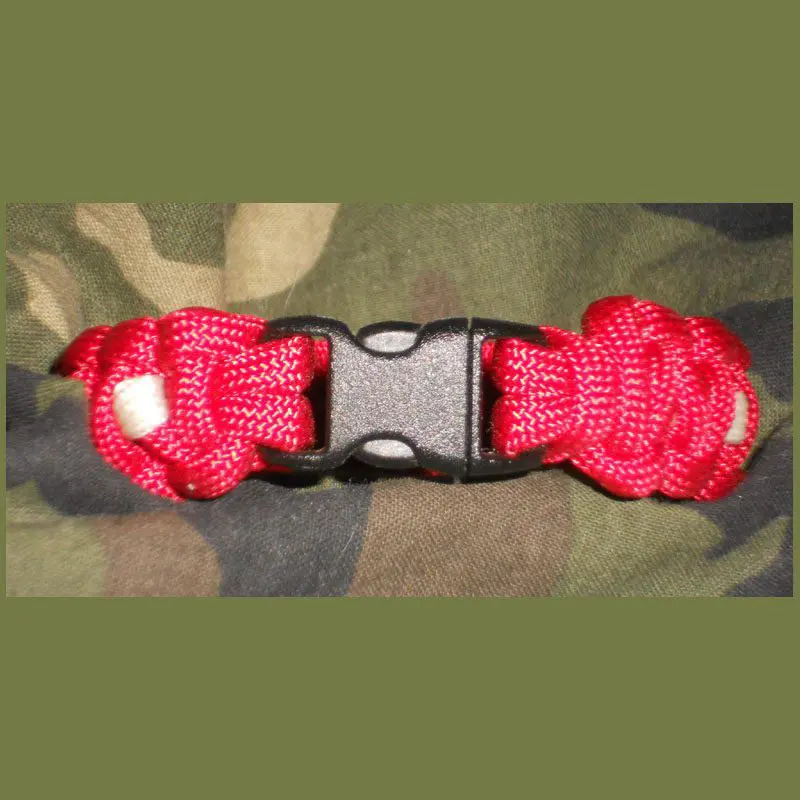 Add our TactiCool SS Shackle with the new adjustable feature to your bracelet for only $4.00! We’ll make your bracelet with a comfortable fit like we always do but now you have the option of tightening it up or wearing it a little looser, the choice is yours! If you want a Paracord bracelet purely for utilitarian or survival use you want your bracelet to be in only one color so that you are wearing the longest continuous length of Paracord. Comes with our durable contour buckle. 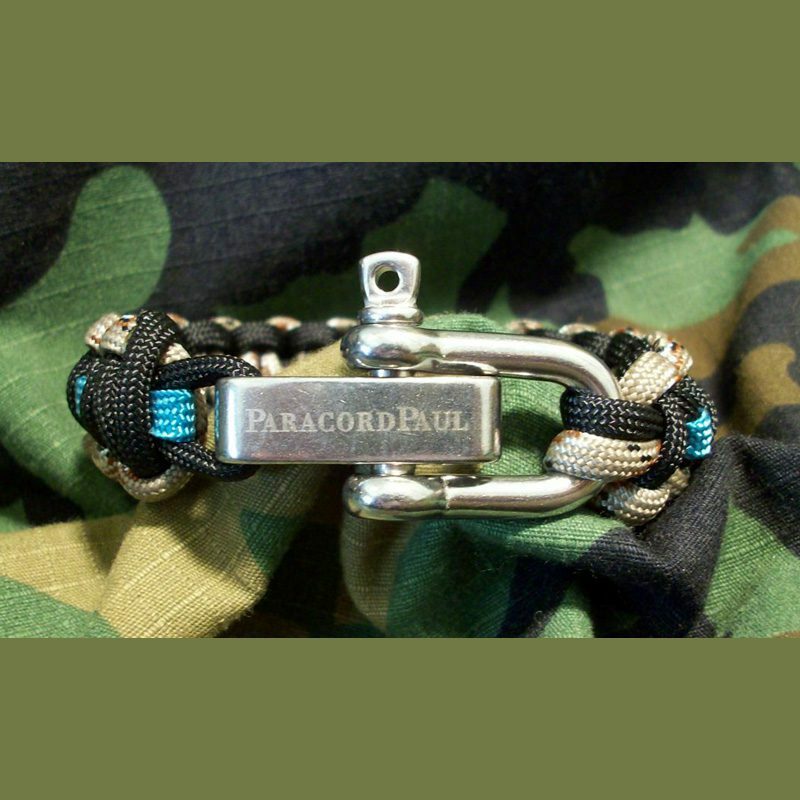 To wear the most cord possible, the King Cobra paracord bracelet is the way to go! How do I provide an accurate wrist size? Get the perfect fit for your bracelets by using these instructions. I need to know your wrist size ? not bracelet size. I?ve made thousands of bracelets and know how to knot up your order for a comfortable fit. But I need you to take a moment to get the right measurement info to me. Why we need your wrist size? Depending on the knot and clasp, I add the necessary length to your wrist size to ensure your bracelet will fit properly. Do not add extra space to compensate for a comfortable fit! First, you’ll need a ruler, a pen or pencil and a strip of paper about a half inch wide. Wrap the strip of paper lightly around your wrist. Mark the piece of paper right were it meets the starting point. Then measure that length on a ruler. Now you know what size to order! 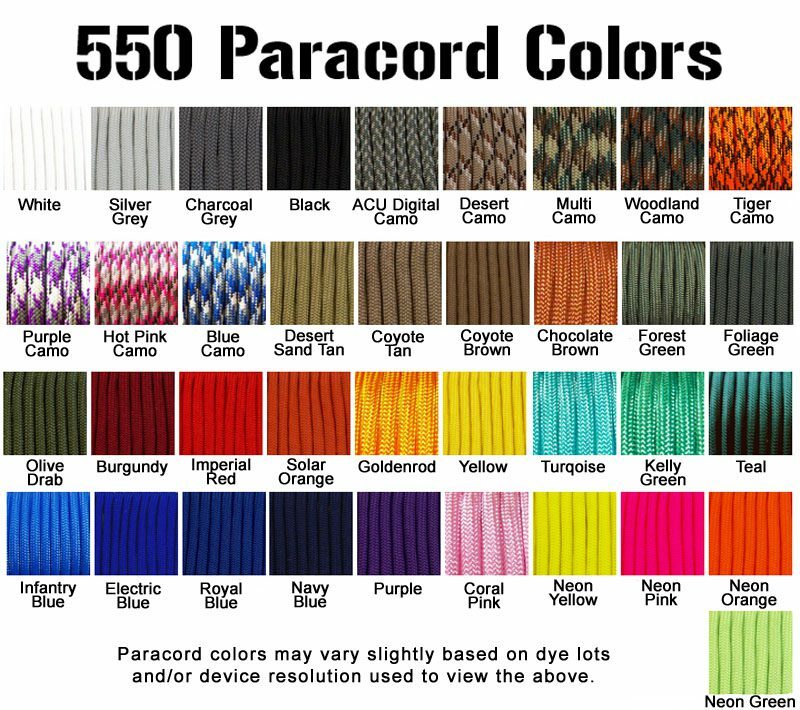 What type of 550 Military Paracord do you use? All of my products are made to order by me right here in the U.S.A. with mil-spec MIL-C-5040H type III requirement cord and have a minimum breaking strength of 550 pounds (550 cord). Not all paracord is created equal — especially the sub-par cord from overseas. My 550 parachute cord comes from the same U.S. factory that is a government contractor to supply the military, so quality is assured. 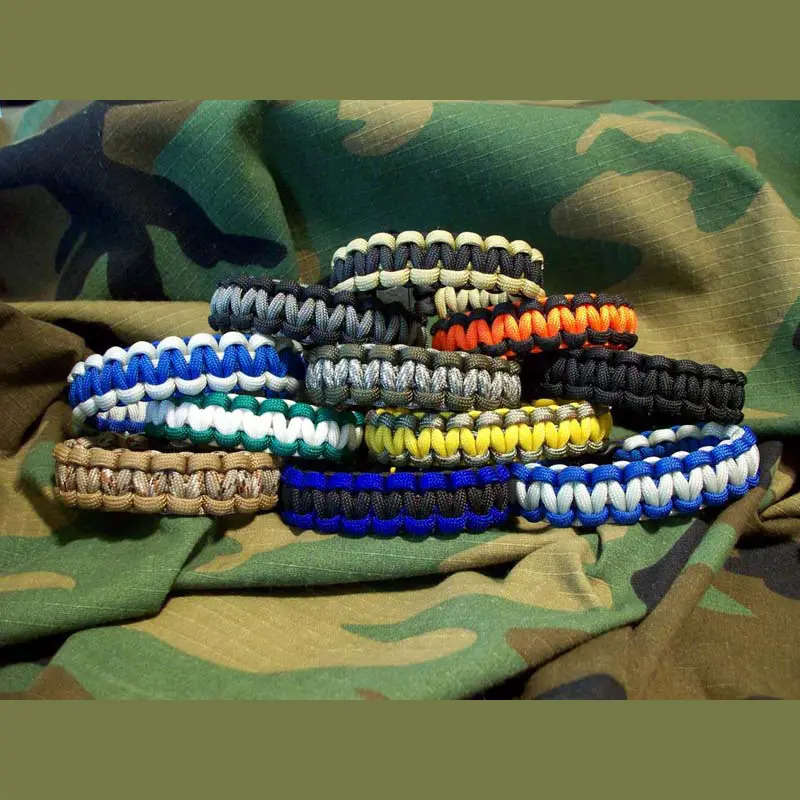 We use the actual paracord our service men and women rely on every day! There is approximately 1″ of paracord for every inch of knotting. This does vary slightly depending on the knot. If you were to disassemble your item you could use the cord and the strands within for all kinds of outdoor and, yes, survival applications. What type of clasps do your bracelets have? We keep it simple. All 275 & 550 bracelets come standard with our black durable contour buckle. On most of our 550 bracelets (depending on the knotting) you have the option to upgrade to our TactiCool Stainless Steel Adjustable Shackle. How long will it take to make my item(s)? Keep in mind each of your items will be handmade to order based on your specific order details. LEO and Military orders are given first priority and always go to the front of the line. Generally, most orders are knotted up and ship within 48-72 hours. Due to the amount of knotting required on larger orders and dog leashes, these orders will take more time ? so plan on an additional 3-5 days. If you have a specific in-house date don?t hesitate to reach out and let us know!